Going through the Welland Canal requires two people to be aboard so I sent to the west coast for a crew. My heartfelt thanks to JoAnn for enduring first hours and hours waiting in airports and the loss of luggage, the rain, the cold and the cramped quarters. Needless to say but I’ve been a little busy. Please keep checking back as I try to get a schedule of blogs started again. There will be times of no contact as I make my way north, but I will be writing about what I see and experience. Your participation in this little adventure is very important to me and I welcome your comments. The CAP’N LEM is docked in Buffalo New York making preparations to transit the Welland Canal on Thursday June 11th 2009. 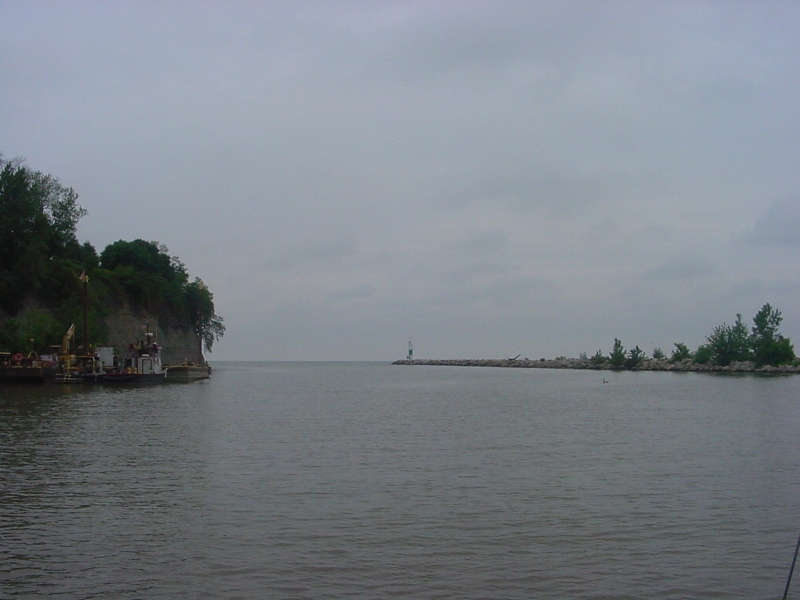 After leaving Rocky River, THE CAP beats to windward on the now familiar short tack long tacks required to make progress against the Northeast winds. 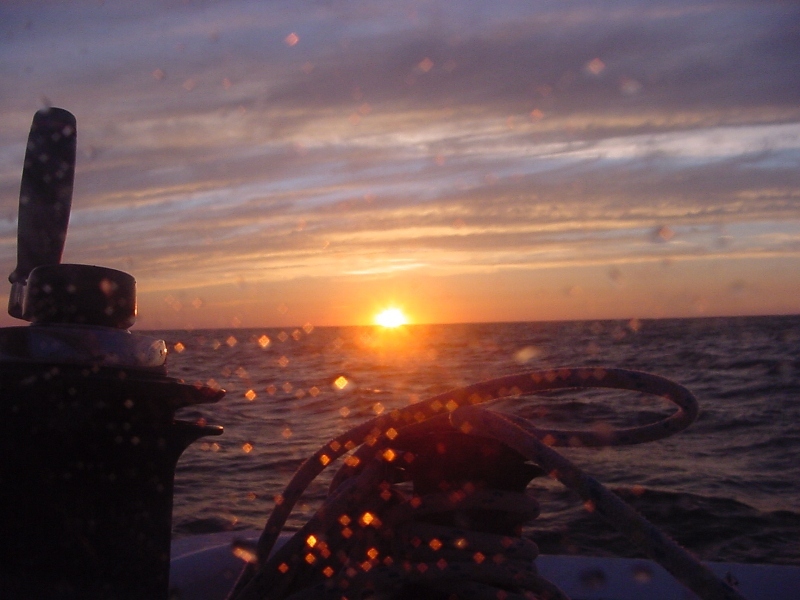 A shift in wind directions that accompanies the setting of the sun helps gain the last few miles to Presque Island. Night navigation gets hampered by the numerous lights on shore near a big city like Erie PA. I check the chart, the radar, GPS, the horizon looking for anything that moves, anything that flashes, anything that stands out of the ordinary, then again chart, radar, GPS, horizon over and over until I’m well in the channel. I don’t worry about grounding so much as hitting something unlighted. I jump at shadows. It’s rare to see another boat out this late, but one lone motorboat overtakes me to port well outside the channel and proceeds me into the harbor. He knows the waters and cuts buoys and corners and is soon out of sight. I don’t let myself indulge in such for fear it might become a habit, a bad habit. I shine a light on the unlighted buoys, I confirm my position and I slow down. Like my father before me, I am a “night watchman” and I let that weight of responsibility hang heavy on my shoulders. I talk to myself and I listen to what I say, “This mile, tommy, this mile is the important one, the one right in front of you!”. At the end of the seawall and before the next buoy, a hard right turn, 90° into a very shallow bay named Misery. The fathometer rises to 4’ below the hull; I raise the dagger board and loosen the rudder just in case I find the bottom. No, down again to 8’ and I’m home for the night at Lat. 42° 09’ 29.3” N ~Lon. 080° 05’ 14.5”W having traveled 1491 nautical miles from Two Harbors MN. At first light, I’m up and out the hatch to see the bay called Misery and marvel that such a place could bare such a named. One thing I’ve learned in my travels is there is no accounting for the names some places are given. Perhaps the local history would explain it but to me a quiet anchorage like this in a beautiful boat surrounded by ducks and geese, and people in canoes on a clear Saturday morning is the stuff of dreams that could bring misery to no one. I get an excited call from Tiny, “Did I see it!” “No, what?” “The NIAGARA, The Brig just left the harbor, full sail.” A picture of a tall ship from the CAP’N LEM is a must. Daylight changes things and coupled with the close scrutiny of the chart the night before I’m out of the harbor in pursuit. I watch as off in the distance the Brig NIAGARA tacks, the sailors on board running to man braces, then hauling to bring the yards around at just the right moment to catch the wind on the other tack before all momentum is lost. The grace and beauty of a tall ship well handled is a thing to see. It makes me glad to be a sailor. The wind is right for my run to Buffalo, and just strong enough to keep me excited and watchful. I leave the NIAGARA and Presque Island behind in the haze very quickly and sail 75 miles before coming to anchor just inside the west breakwater of Buffalo Harbor at Lat. 42° 52’ 28.2” N ~ Long. 078° 54’ 09.4” W having traveled 1566 NM to date. I settle on a close reach in a North East wind leaving South Bass Island. The day passes uneventful with a few tacks. My progress up Lake Erie is painfully slow. I sail into the dark to make Rocky River. Anchoring each night on the lakes is a safety issue. Fatigue plus darkness is a recipe for mistakes. I must always put safety first, otherwise I’m just some stunt man vying for attention. Not my style. I calculate risk, check variables and weather and play a lot of “what if” scenarios in my head. Darkness in its self is not dangerous. Fatigue is more so in its ability cloud reason. I make for an anchorage aware I have both. I won’t always have the luxury of protected anchorages. I’ll deal with that, then. Tonight I anchor just inside the breakwaters of the Rocky River below the cliffs where mansions overlook the river and lake. I hope they do not resent my presents in their view. The CAP’N LEM is lovely to look at, clean, sleek and tidy. Tomorrow I’ll be gone leaving no trace of my having been here but a scratch in the mud 8 feet below the surface of the water at Latitude 41° 29’ 21.5” N ~ Long 081° 50’ 11.7” W. This point is the south most I will travel this voyage. It is all up from here. NOTE: I have changed the format for reporting my latitude and longitude from degrees, minutes, tens, hundred, thousands to degrees, minutes, seconds, tenths of seconds. Google earth is in this format and this may help some locate my anchorages easer. The accuracy of the positions is based on my GPS unit and the numbers imply accuracy that may or may not be there. Many times the GPS Map Plotter and the track line do not match on large scales showing small areas, but the “repeatability” of the track is very accurate. By that, I mean if a track line goes over a break water coming in because the map is not exactly where it should be, I can find my way out again by following my track line in luau of the map. I often use this coming out of shallow water areas. If I got in I can get out. That will change with salt water and tides. On those scales, I always use my seaman’s eye to keep from hitting anything. The GPS gets me close enough to do that. My radar on the other hand shows me buoys and breakwaters as they really are and therefore is the major instrument in fog. However, it too, has draw backs at close range. Too close and the object disappears in the clutter. Nothing replaces good seamanship. All limitation taken into consideration allows me to enter these very tight spaces in safety in the dark. NOTE TO TEACHERS: The concept of minutes and seconds being measurements of arc as well as time is very complicated at any age. When I speak of “arc” it is the curvature of the earth expressed in degrees, minutes and seconds. One can be converted to the other and the math involved is interesting and not that hard once it is understood that one minute of time does not equal one minute of arc nor does seconds of time = seconds of arc. It all has to do with the spin of the earth on its axis. Facts: it takes the earth one hour of time to travel 15 degrees (one time zone), 24 hours of time to travel 360 degrees (one day). Leap years are important. The sun never rises or sets, the earth turns. And the sun is the only star you can see in the daytime with the eye. In electronic navigation, nano-seconds count. 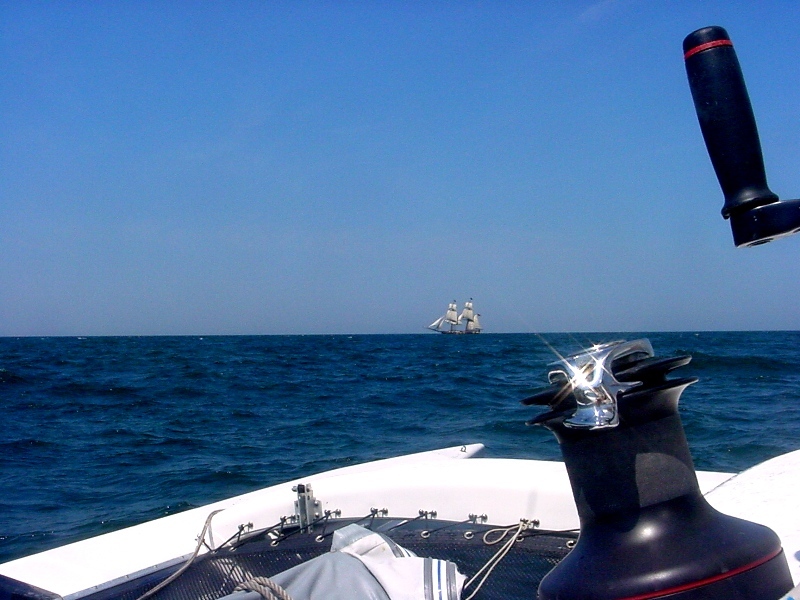 June 1, 2009; I’ve left Josh and Tiny to their land adventures and caught the afternoon South West breeze on to Lake Erie. The wind is warm and just strong enough to scoot the Cap’n Lem along toward the Bass Islands. They are still over the horizon but I expect to see them any time now. If this wind holds I may sail into the night. The moon is waxing and the lake is lovely. It doesn’t. At sunset the wind sighs and dies. The islands are just ahead. To the South in the distance, flashes of lightening, a storm is brewing. Will it overtake me? I motor the last few miles in the calm water to Put-in-bay on South Bass Island. I’ve experienced lots of things on the water in my 43 years, but a lighten strike isn’t one of them. I hope to keep it that way as long as I can. I take extra precautions. 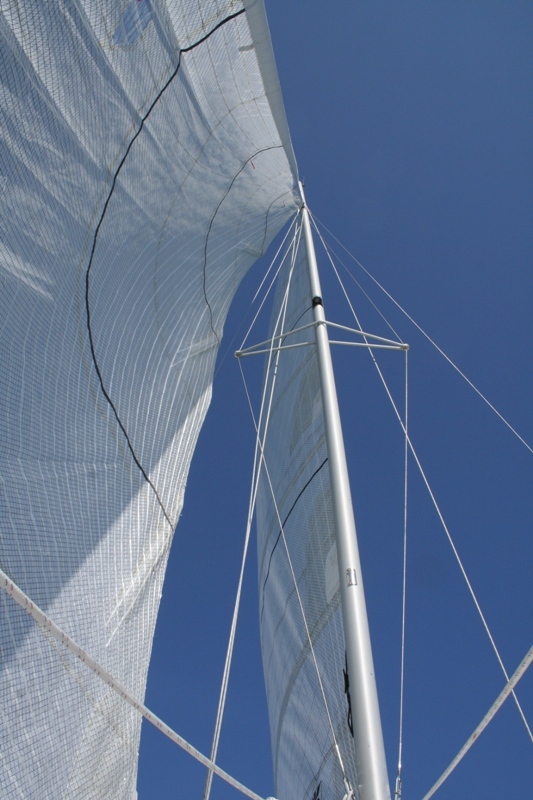 A battery cable clipped to the shroud might help disperse a charge building up in the mast. That’s a lot of metal 40 feet in the air on a stormy night. The stainless steel gantry is bonded to a hull plate. I make mental note to not touch metal any more than I must in operation of the vessel. I get the mainsail down and stowed. The storm is closer now but still to the south. The wind comes up. North East and 20 kts but I’m in the islands making way to the bay. The lightshow is spectacular. I don’t often see such on the Olympic Peninsula. My excitement builds. Too bad the word awesome is so over worked. A fast ferry, that is a very fast ferry, comes up behind me making way into the harbor. I check my stern light and move even more to the right feeling my way into the anchorage. But there is no anchorage in Put-in-Bay! Only mooring buoys and lots of them neatly spaced in row after row. It sure must be something to see them all filled on 4th of July. I had rather anchor; catching a mooring buoy sailing alone is bit trickery. But the Cap’n helps by drifting down on buoy H-6. I catch it with a line, quickly tie a bowline and feed the bitter end through the loop. I’m careful not to let the line pull me from the amma always reminding myself I can let it go if it becomes too much. I can always come back around and try again, but no… bitter end through the deck bolt, another bowline…I’ve got it. Put-in-Bay is protected on all sides, all sides except the NNE. “How does the wind blow, Mr. Mate?” “NNE, Sir!” The rain hits, the lighten misses and the Cap’n spends the night bobbing and weaving like a prizefighter in practice. I sleep but little at Lat. 41° 39.318’N ~ Lon. 082° 49.283’W. A headwind is not so bothersome when there is plenty of room, plenty of time and the wind is warm, so it is when I leave the Detroit River for Toledo Beach, MI. I practice my tacks purposely making little mistakes to learn which one puts me “in irons”, that is, stops my forward motion and starts the vessel sailing backward. If not corrected, the vessel then comes back onto the tack it started on. In tight quarters, this is not good. In open water it can lose very quickly any progress the vessel has made to windward. To a sailor, “in irons” conjures up terror, “Master-at-arms, clap that man in irons!” few landsmen would ever know. To the captain, “Sir, the ship is caught in iron!” was no less terrifying. I practice. So the ways of doing things aboard ship become tradition and the traditions became the way to teach those who could not read or write. Oh, they were smart, these seamen, they were talented beyond comprehension. They could do things with their hands and their minds, their courage and there cunning that always left the landsman passenger staggered with disbelief. For the most part, they just couldn’t read or write. No one had taught them. I never take literacy for granted. Winding the chronometer everyday at the same time and reporting it to the Captain just before noon was a tradition born of necessity to have accurate time. Accurate time meant accurate longitude! Removing one’s hat before entering the mess deck, born form respect for those shipmates injured in battle on deck, who died laid out on the tables of the mess. 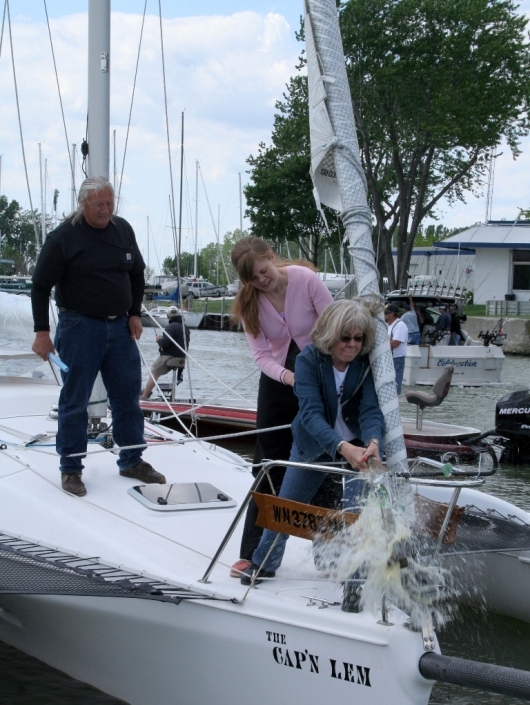 I tack my way to Toledo Beach MI to observe the time honored tradition of “Christening”. True, christenings usually happen at the launching of vessels, but circumstances have changed detail and there are some things more important than that detail. My course has brought me close enough to have The Captain’s youngest daughter come to do the honors. The same prayer is said over the Cap’n Lem as was said many years ago at the christening of his SCHOONER TONI & DONNA. This would have pleased Captain Lem. The afternoon was spent in remembrances of Capt. Lem and friends long ago. We forging our friendships in good feelings and laughter. It was the way it should be. And people came to visit! Boat People! Boat people are the friendliest people in the world. Two boats pass on the lake, one sail, one power, makes no difference, having never seen one another, most likely to never see one another again, they wave. THE CAP’N LEM and the solo-sail have a way of catching people’s imagination and I love it. They want to know everything. Where I’m from…when will I get there… what’s the peat moss on the stern for? I never tire of the questions they ask or telling the stories of how and why. It is how I take them with me. I’m sure I could have even won the Sheriff’s Deputy over given time and a different setting. You are currently browsing the archives for the Lake Erie category.